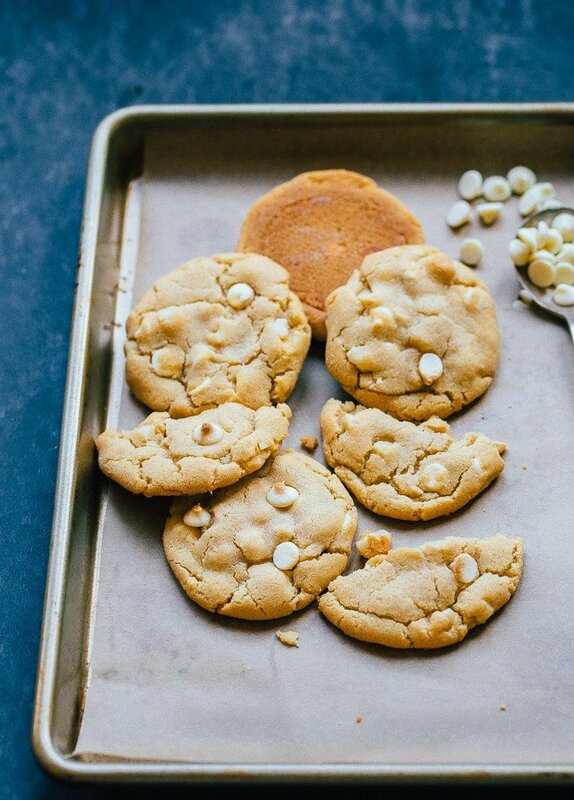 White chocolate macadamia nut cookies are the bee’s knees. And you know it. This is a small batch recipe that makes 6 cookies, and I ate all 6 of them in a day. There are things you do for love, and there are things you do for the love of cookies. In my case, I made these white chocolate macadamia nut cookies around the clock for 12 hours. I started with a tip from a reader that my small-batch chocolate chip cookies could not be modified into white chocolate macadamia nut cookies, and it perplexed me. How can adding nuts and replacing dark chocolate with white chocolate chips make so much difference? I started out scaling down this recipe by making Sally’s full-size batch of white chocolate macadamia nut cookies. Her recipe is perfect–soft and chewy and full of macadamia nuts. But, 3 dozen cookies was too much for my house (you know this). So, I cut the recipe in half, and made it 6 different ways until I settled on this version you see pictured. These cookies do the pretty ripple thing around the edges when they bake, and as they cool, they crack a bit, too. They look like they came from a bakery (and they taste like it, too!). I get asked often why I only use egg yolks in my cookie recipes. One egg is made up of 1 tablespoon of fat (the yolk) and 2 tablespoons of binding protein (the egg white). When it comes to cookies, we just want the richness of the fat. I rely on butter to bind my cookies together and leave out the egg whites. If you’re wondering what to do with the leftover egg whites, I have a whole page full of recipes that use egg whites only. And one for recipes that use egg yolks only. Because we all want perfect small batch desserts, but no wasted eggs! Softened butter is not room temperature butter. When I troubleshoot failed/ flat cookies, this is almost always the cause. Softened butter is butter that has been sitting on the counter at room temperate for about 20-30 minutes. You can press a finger into it and make an indent, but your finger does not go all the way through easily. 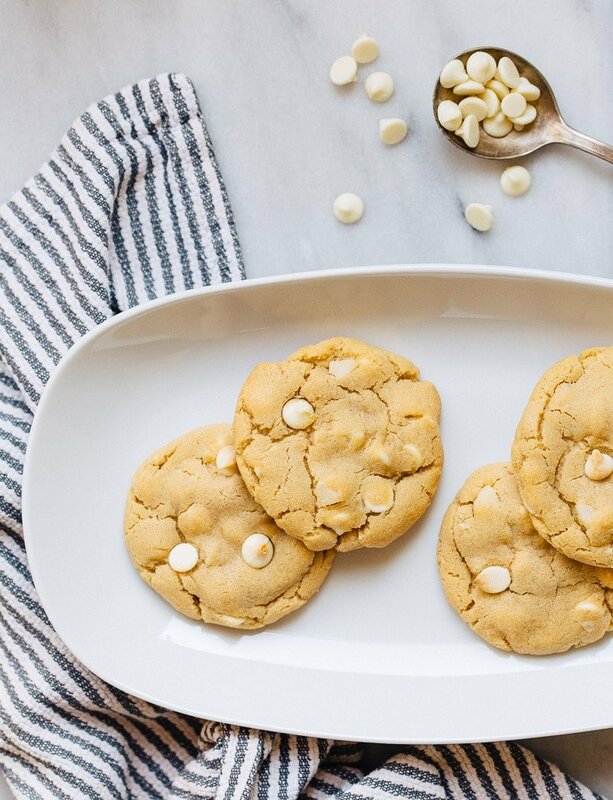 Use just the egg yolk for this small-batch white chocolate macadamia nut cookies. Measure your flour by scooping it, heaping it over the measuring spoon, and then wiping off the excess with a butter knife (or other flat surface). Oh, and 7 tablespoons of flour is 1/2 cup of flour, minus 1 tablespoon. Small batch white chocolate macadamia nut cookies. Recipe makes just 6 cookies, and please, only use the egg yolk, not the entire egg! In the medium bowl, add the softened butter, brown sugar, granulated sugar, and vanilla extract. Beat until light and fluffy, about 40 seconds. Finally, sprinkle the flour, baking soda and salt evenly over the surface, and beat to combine everything. Stir in the macadamia nuts and white chocolate chips by hand. Divide the dough equally into 6 cookies (about 46 grams each), and space evenly on a baking sheet. Bake for 9-11 minutes, until the cookies are light golden brown on the edges and the surface begins to crack. Let cool completely, and store in an air-tight container at room temperature for up to 2 days (if they last that long). *Tip: 7 tablespoons of flour is 1/2 cup of flour, minus 1 tablespoon. Oh my! These look amazing!!! These will be the next thing I bake FOR SURE!!! So I read your post, but I’m curious if you could swap out white chocolate chips for dark chocolate chips and it would work? It seems like it’d be fine but just wanted to know what you think! Yep, it was the nuts that thinned out the batter. But also: chocolate chip cookies are different than these, you know? Chocolate chip cookies should have crisp edges and slightly chewy centers. 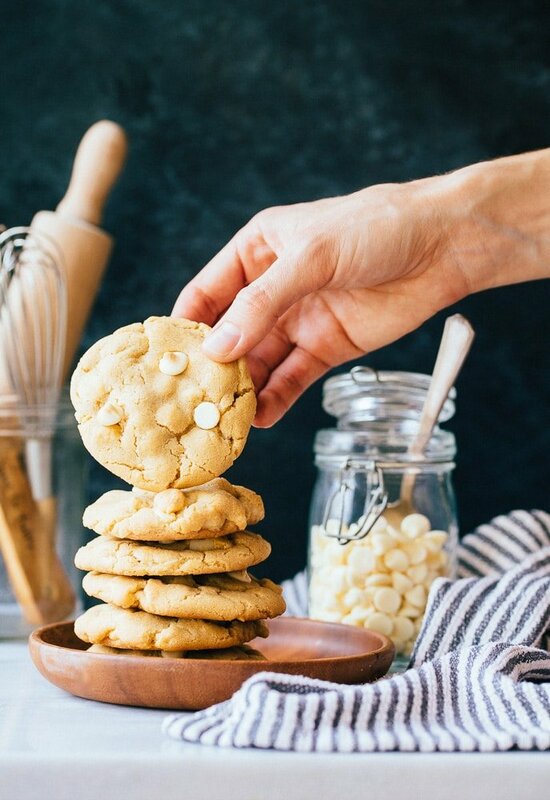 White choc macadamia nut cookies should be soft and chewy all throughout. Thank you for knowing what recipes we need. I was thinking cookies and this one just sings to my heart. Well…true to my word…I just made these….and I am in heaven!!! These are the best version of this cookie I have come across!!!! Thank you!!!! Hi! Just wanted to send an update…I have made these several times for several folks and they all agreed this is the best version of this cookie they have ever had!! Thanks so much for the awesome recipe!!! I would have to double the recipe because my poor husband would not get any! Can’t wait to make these for myself! Hubby is not a white chocolate fan Thanks Christina! Just made these cookies and they were amazing!! This recipe will be a keeper ~ can’t wait to try some of your other desserts for two! My mom had a few people over last night and was planning on serving just cheese and crackers. Cheese. And. Crackers. I mean cheese and crackers are good but who has company over and then doesn’t provide dessert? Mission accomplished: they’re still friends. I will definitely be making these again (made them once already). I only test the recipes as you see written here. This recipe looks pretty straight-forward when doubling, so go ahead. And good luck! Also, for the brown sugar, it is measured like regular sugar, or packed? Packed, sorry. Will update to clarify that all brown sugar should be measured packed. So, did you follow the recipe exactly? Any substitutions? How is your oven? What did you line your pan with? Delicious! Baked beautifully and tasted marvelous! Thank you for the recipe! 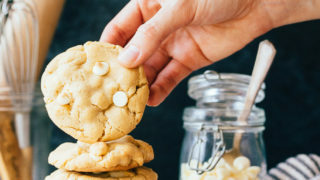 We NEEDED a recipe for White Chocolate Macadamia Nut Cookies and we are so lucky that we found your recipe. Absolutely, the BEST EVER! Thank you. Can’t wait to try something else. I made these and they were awesome! A quick question though: you say to divide into six cookies and space evenly on a cookie sheet. Does that mean make 6 balls of dough? Or flatten them out into cookies? I kinda did in between the two, and they turned out lovely, but was wondering if they would flatten on their own from just balls. Love to read everything you do!